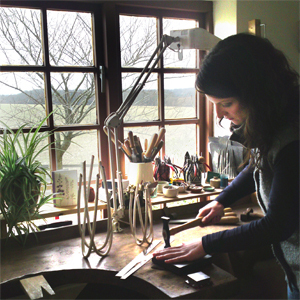 Olivia grew up in Surrey where, upon discovering her love of working in metal, she moved to High Wycombe in 2001 to study Metalwork and Jewellery (BA Hons) at Buckinghamshire Chilterns University College, followed by an MA at The Royal College of Art in London. On completing her MA in 2006, Olivia returned to her hometown of Farnham to set up her studio, and then with business growing she recently moved to a beautiful new studio in Hampshire, from where she continues to design and make the sculptural silver vases for which she has become known. Olivia specialises in designing and making sculptural silver vases. Her inspiration comes from the flowers themselves and through her work she creates innovative forms where the vase itself is as visually interesting as the flowers it holds, the two elements working together to create a single, unified composition. For her most recent pieces, Olivia individually hand-forges four long strips of silver into two-dimensional curves, before being bending them up into three-dimensions and fitting and soldering them together. The crisp edges of the vases combine with the graceful fluidity of a linear form. The cross section widens and tapers to work with the outline of the vase, both emphasising form and controlling balance.